Sometimes perception isn’t reality — that becomes clear when motionless patterns of dots appear to be spinning or rippling — but how we perceive ourselves and our social worlds might be another matter. 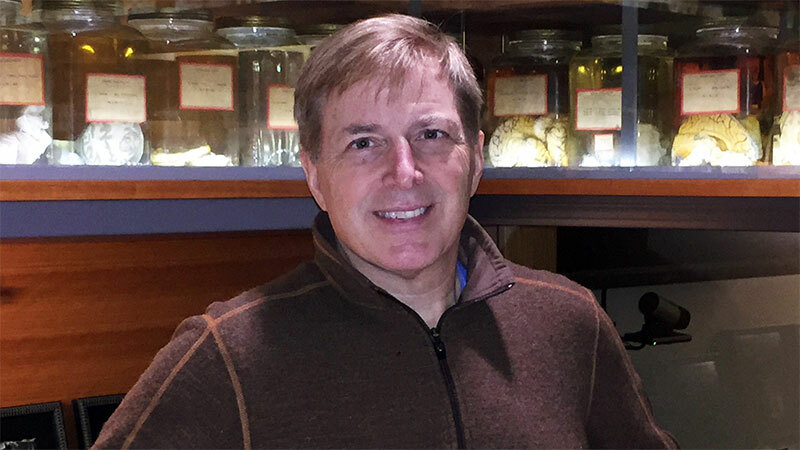 UO professor David McCormick, the director of the Institute of Neuroscience and one of two UO presidential chairs, will give a community science talk titled “Mind, Brain and Reality” at 7 p.m. Tuesday, April 17, at the John G. Shedd Institute for the Arts. It is part of Science Knight Out, a series hosted by the Phil and Penny Knight Campus for Accelerating Scientific Impact. McCormick, who came to the UO in 2017 after three decades at Yale University, is known for his research on a range of brain mechanisms, including the neural circuits of epilepsy, the brain mechanisms underlying sleep and the neural mechanisms of top performance. “Mind, Brain and Reality” will focus on another area of his expertise: how the brain creates its own reality and how that reality can be improved through mindfulness meditation, the practice of being mindfully aware. McCormick has practiced mindfulness meditation for around 10 years, ever since he first encountered research that supports it as a way to increase life satisfaction. Research, he says, also shows that mindfulness meditation can decrease anxiety and help people fight addiction. Mindfulness meditation involves bringing one’s attention to the present moment. Many practitioners focus their minds on their bodies and the sensation of breathing. The human brain, McCormick explained, creates models of the world through information indirectly received from the senses. It analyzes quickly, making best guesses, and is prone to slipping up. It’s easy to see where it can go wrong in sensory systems. Optical and auditory illusions are obvious examples. While the brain creates models of the physical world, it also makes models of a person’s emotional, cultural and social worlds. These models are also created through shortcuts and best guesses, but the resulting illusions — or biases — can be much harder to spot. Some of the longest practitioners of meditation historically are Buddhist monks. McCormick spends part of his summers teaching neuroscience to Tibetan monks in India, something he will also touch on in his talk. The monks want to learn the scientific method because it is a tool by which people’s understanding of the world can be enhanced, McCormick said. But just as there are questions that can be answered with science, there are questions that science cannot yet answer. For example, one of the biggest mysteries in neuroscience is how the brain, a collection of neurons firing signals to one another, gives rise to the conscious experience of being human. The talk is part of Science Knight Out, an ongoing series hosted by the Phil and Penny Knight Campus for Accelerating Scientific Impact. In addition to McCormick’s talk, the evening will begin with a highlight of important science topics in the news by Knight Campus acting Executive Director Patrick Phillips and end with conversation on the major themes raised during McCormick’s presentation. The lecture series strives to fulfill the Knight Campus mission of bringing the excitement and benefit of scientific research directly to the public.